Have you ever been in a situation when you know you need a good soak but you don’t have a hot tub? Being in this situation is frustrating, and it makes you wish for a Jacuzzi, doesn’t it? 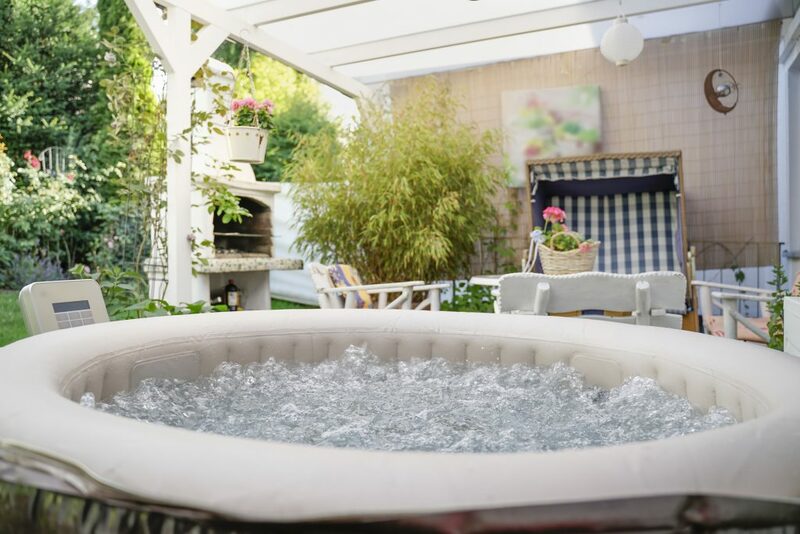 This is the reason owning a portable Jacuzzi is still popular today – so people can soak and relax whenever they need it. It’s good for renters or the people that don’t have much space in their home since you can stow it away after use. They have a lot of other things they’re good for; keep on reading and see the top 5 benefits of a portable hot tub. Is it worrying you that a portable hot tub won’t give you the same benefits of a hot tub? Fret not, we can assure you that a portable model can still give you the same experience. The main difference between the two would be the portability, and as for everything else, there’s always a model that can provide what you need and want. For example, you can still have numerous customizable jets, which can give you an invigorating and soothing massage. It can operate at your desired temperature, and it might even come with a timer so it starts heating up before you come home. If you like throwing parties, choose a portable model that has light features. In summary, you can still have the benefits you want from an in-ground hot tub when you opt for a portable tub. Sure, it won’t look as good, but there’s sure to be a model that will fit the aesthetics of your home. Its portability is its major selling point, allowing you to use it anywhere and anytime you like. Do you want to move it in the shade or do you want to move it closer to the back door? Either of which is no problem at all; it’s pretty easy to install. You won’t feel the hassle of disassembling it and assembling it in another location. This also then promotes usage; you won’t have to skip your planned Jacuzzi night because of a little rain. Even when it’s winter time, you can move it to a spot without too much snow build-up or into your house. Transporting it isn’t much of an issue, as well, so if you want to go have a fun night chatting with your friend at their house, you can pack the hot tub in the back of your car and go as you please. The best thing about it is that you can store it away when not in use. It’s not every day we find the need to use a hot tub, and there are times when we’d need the space for something else. With a portable one, you can take it out only when you need it. Don’t let its inflatable element make you think that it’s flimsy and prone to breakage. On the contrary, it’s quite sturdy and durable to last you through many parties. Manufacturers built it so that it can withstand numerous usages – after all, users will need to install it and take it apart multiple times. With high-quality materials, you can be sure that you’ll be able to use it for a long time. A portable Jacuzzi tub is also pretty comfortable to sit in, as well. An inflatable one provides a nice cushion for your back to rest on, while a plastic model can have a liner. The soft liner allows you to lounge in a relaxed way, making sure you enjoy your spa experience. As we said above, it’s sturdy so you won’t have to worry about the side you’re leaning on breaking down due to pressure. You can be as comfortable as you want as opposed to some in-ground tubs. Some have rigid and plastic materials, which can be uncomfortable to sit in. Your back doesn’t have a proper cushion, and it doesn’t feel too good on the skin, too. Did you know that a custom in-ground spa costs around $15,000 to $20,000 on average? Even the cheaper option is too expensive – acrylic shells are at around $3,000 to $12,000. That doesn’t include the installation costs, which can go from $3,000 to $5,000. Not everyone who wants to enjoy a nice and hot soak has that kind of money, which is why a portable model might be the right product for them. For only $500, you can already have a good quality model of a portable hot tub. That means if you have a $1,000, you can spend the rest on accessories, which can further elevate your spa experience. You can buy drink holders, headrests, some steps for easier access, or even entertainment stations. You may even buy a higher quality hot tub or a bigger one with that kind of budget. Some models can go up to $4,000, which still turns out to be less expensive than cheap permanent hot tubs. For that price, you can have an even better experience than you would have on a cheap in-ground tub. With thousands of companies manufacturing a portable hot tub, you can be sure to have a wide selection. You can buy a small one for you and your spouse or you can buy a bigger one for when you have some friends over. Note that some models can run a bit small. When the box says 2 to 4 persons, it most likely means 2 adults and 2 children will be comfortable sitting in it. Even then, it might be a little too cramped for them. Check the dimensions and if possible, check out the assembled product. If you’re unsure and you have a little wiggle room in your budget, buy the next size. It will also determine your comfort level. Of course, you can only enjoy the benefits of a portable Jacuzzi if you buy the right one. It must suit your taste and needs, but it must also come from a good manufacturer. If you need help in choosing, check out our list of the best portable hot tubs 2018. For more tips about hot tubs, visit our blog now. CLICK HERE TO CHOOSE YOUR OWN PORTABLE JACUZZI!